!! OMG, “I don’t believe in regrets”: John Travolta gets candid about his marriage !! “I don’t believe in regrets,” John Travolta recently told reporters at the 2012 Zurich Film Festival, where he is this year’s recipient of the festival’s lifetime achievement award, the Golden Eye. 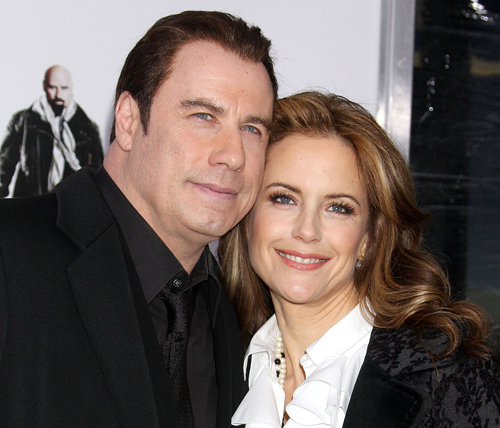 Asked about the importance of having a wife (Kelly Preston) and family by his side, Travolta said, “As long as it’s the right wife and the right family, I think it’s marvelous. I have the right one, and I’m very happy for it. I know we’re kind of dinosaurs in Hollywood, being together so long. But it works.” What, pray tell, does “the right wife” mean? Doesn’t Travolta mean the right… beard? 1 Comment on "OMG, “I don’t believe in regrets”: John Travolta gets candid about his marriage"
Good for John. Looks like he handles issues pretty well.